Enlight is an awesome photo editor for your iPhone and iPad. Think if it like a simple photoshop for iPhone. And I mean the word "photo editor" literally. 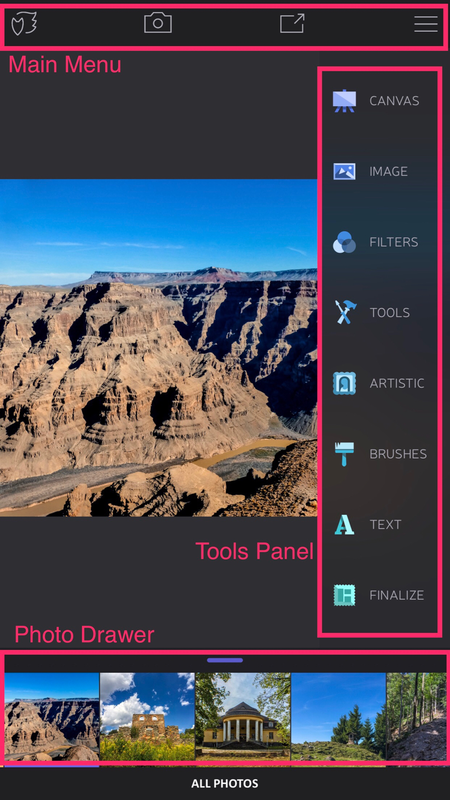 Enlight is not just another filter tool. It has lots of different ways that you can use to enhance your iPhone photos right on the iPhone or even iPad. If you have some experience using other photo editors like Photoshop or Pixelmator on a computer, you'll find your way easily in Enlight. If you don't have previous photo editing experience, I still recommend to give it a try and learn how to work with Enlight. Its worth it. All the things Enlight has to offer could fill an entire book. So I can only give an overview of what Enlight can do in this review. More specific Enlight tutorials are coming soon. Adjust brightness, contrast, exposure, offset, structure, sharpen, black point, shadows and highlights, saturation, hue, temperature, tine, white point, split toning and curves for all or just red, green and blue. Yes, you can use filters too and it comes with a set of analog filters, black and white filters and duo tone filters. All of them fully adjustable. Layer two images. Great if you want to fix e.g. a sky and add some clouds for example. Plus, you can use the target tool to apply an adjustment only over a rectangular or circular region of your shot and adjust exposure, contrast, saturation and hue for that area. Additionally, editing is non destructive. Enlight saves each adjustment and you simply can go back and remove each change you made step by step. It will even save editing sessions so you can continue later. Pretty neat, right? Enlight has become my main photo editor on the iPhone whenever I need to retouch a shot or do some advanced editing that I previously needed my computer for. And finally, Enlight runs on your iPhone and iPad and supports the Apple Pen on an iPad Pro. The Enlight user interface might look a little confusing. So here is an overview about it and where you can find all the fancy tools I mentioned above. The Enlight user interface has three main areas. Let's start at the bottom. In the main menu you'll find (from left to right) Enlight settings, access to the camera to shoot a photo right in Enlight, share menu and toggling the tool panel. Check that the Export Quality is set to JPEG 95, that will give you good quality with a decent file size. Adjust the Max Export Size. I've set this one to Max. The remaining options are sessions settings. They control how animated sessions work; a way to play back your editing process in a short video and finally you can control how many editing sessions Enlight will remember. I start off by doing the basic stuff which is removing things with Tools > Heal and/or layering another image by using Tools > Mixer. So basically the first step is to do all the basic fixing of the photo. Then I use Image > Adjust and start with a preset. Then I tap "tools" and fine tune it if necessary followed by clarity adjustments. The last step here is always applying some minor noise reduction. Next step is cropping followed by sharing. If you've just installed Enlight, then the app will help you by displaying animated tool tips for many functions if you use them for the first time. The tool tips are excellent and will demonstrate how a certain tool works. Take those few extra seconds and watch them. Enlight is a powerful photo editor for your iPhone or iPad. For the regular price, was $3,99, at the time of writing you get a load of tools to improve your images. When Enlight came out, it replaced half a dozen of other apps for me. If I should name three highlights of Enlight, it'd be the fine granular adjustments, brushes and noise reduction.